Why does my neck get tight when I reach overhead? Why does the base of my neck get tight? What can I do when my neck gets tight? I asked myself these same questions. From time to time when raising my arm overhead and holding it there for more than a few seconds my neck would start to feel very tight and uncomfortable in the upper trapezius region. This had happened on several occasions in the past and I wasn’t able to figure out anything that fixed it. Warrior poses in yoga killed me. I felt like my arms were made of concrete. I avoided any sustained overhead movement and it was a major interruption to my regular handstand training. Two days ago I headed straight to the airport after a full workday for a late evening flight to Vancouver Canada. The next morning I was experiencing neck tightness while practicing overhead stabilization exercises in the SFMA level 2 course I was taking. The tightness was not constant and I only felt it while holding my arm overhead. It turned out that a room full of physical therapists and chirpractors is a great place to be experiencing such tightness because we immediately began working on techniques to resolve this tightness. We quickly figured out that neither my shoulder nor my neck were actually tight, that is to say they both had full range of motion. The tightening sensation I was experiencing was not an inflexibility but rather a coordination problem. I was contracting my upper trapezius more than I needed to but I couldn’t consciously make it relax. After trying a few unsuccessful techniques to reduce the tightness we decided to try the supine lift. 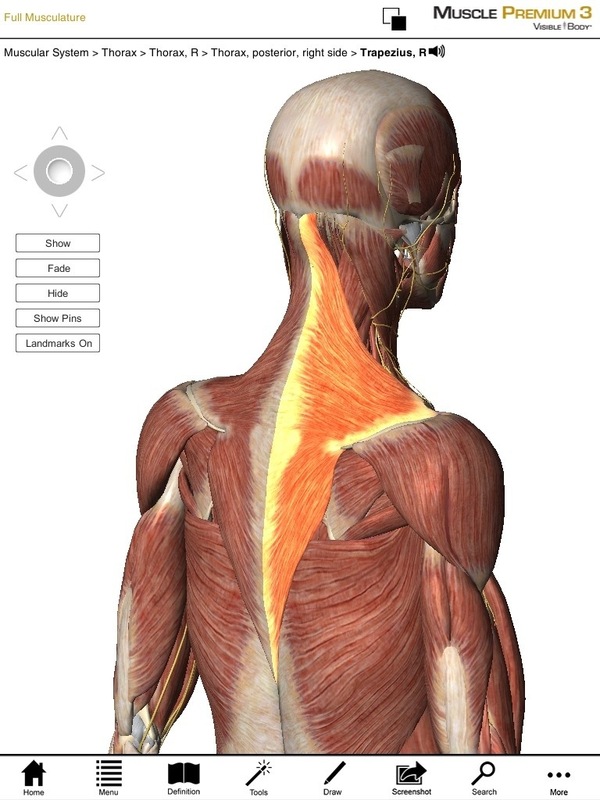 The right upper trapezius relaxes when you rotate the neck to the right. Lying on my back I held the band and pulled it overhead with a low enough resistance that I didn’t feel my neck tighten. When I brought my arm overhead I turned my head to look at my arm. Rotating the neck to the right requires to right upper trapezius to relax because the right upper trapezius is a leftward rotator of the neck. We gradually increased the resistance but did not raise it so high that my neck tightened up. After about ten repetitions I was lifting a fair amount of resistance without tightening my neck. I went up to a half kneeling posture and tried raising my arm with a band helping me pull my arm back. This essentially made my arm lighter and allowed me to relax the neck. We continued to use the right neck rotation technique and gradually reduced the amount of assistance until I was able to raise my arm overhead without tightening the neck and without assistance. Mission accomplished. I propose that the supine lift progressed to half kneeling assisted shoulder flexion can be used to help others with this problem of over-using the upper trapezius. How to get rid of neck tightness when you lift overhead. -Kneel with one foot forward and a band attached overhead and behind you. 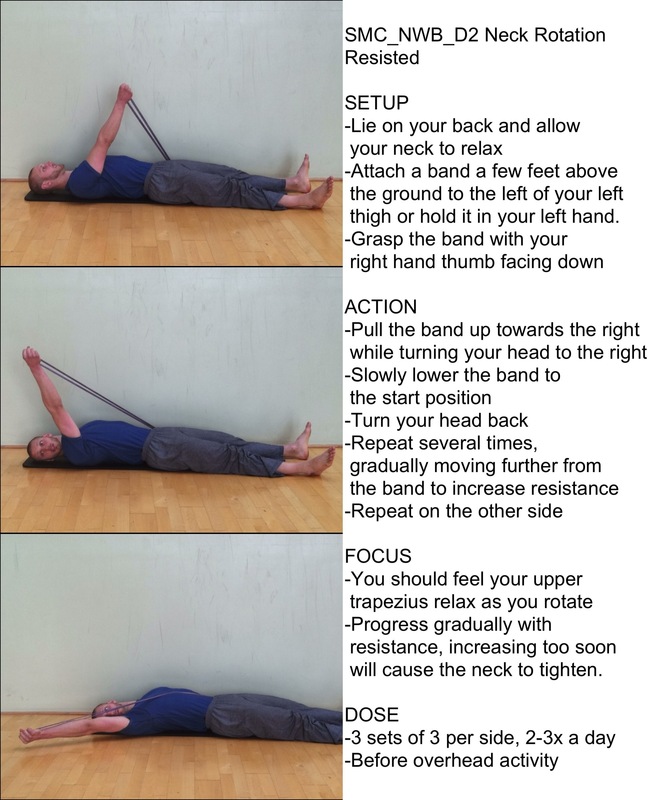 Raise your arm overhead allowing the band to help you. *I have also seen this exercise called the “chuck.” I like calling it the chuck because it reminds me of the functional roots of this exercise on the farm throwing bales of hay up on a cart. Most people have no clue what I mean by a chuck though so I revert the pedestrian, practical and perhaps too generic name of “lift.” The counterpart to the “chuck” or “lift” is pulling down in the opposite direction and is call the chop like a woodchop. Chop and chuck has a nice ring to it in my opinion. **The one arm variation of the lift described here is also known as the diagonal 2 flexion pattern in proprioceptive neuromuscular facilitation or the PNF D2 flexion pattern for short.